Interactive Memories, Inc., 2014. 20 pp., 18 black & white illustrations, 7x7". This special signed edition 'Mosaic' book includes the best of Photographer Tony Bonanno's 'Synergy' series and includes the 14 images in the Photo-Eye Show. 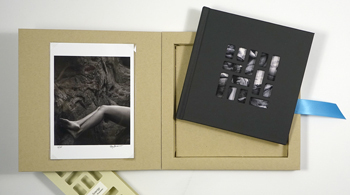 This special edition includes a signed 5x7 inch (paper size) archival pigment print and includes a beautiful gift box that cradles your 'Synergy' book. 'Synergy' makes a thoughtful and personal gift.